Bring your dad for free to UBC Botanical Garden! The Calgary Zoo's Superhero Plants! Parkland Garden Centre: Pollinator Garden - What's the Buzz?! Make your own garden stepping stone! Fun Kids Activities at the International Peace Garden! BUG TASTING for Junior Gardeners of all ages! Jensen Nursery and Garden Centre. 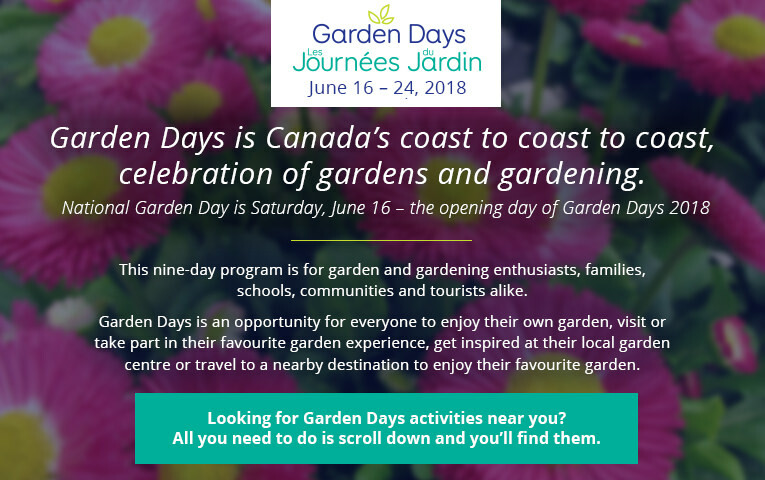 Ten-day Garden Days Sale! Farmgate Gardens' "Music in the Garden Series"
In the Garden at the University of Guelph – it's our 50th Anniversary! Drop in and discover The Guelph Enabling Garden! Quiet celebration in a 19th century setting. Making Bee Baths...and attracting pollinators to your garden! Snap a Photo in Our Greenhouse and Win! Bradford Greenhouses Garden Gallery Anniversary Sale!